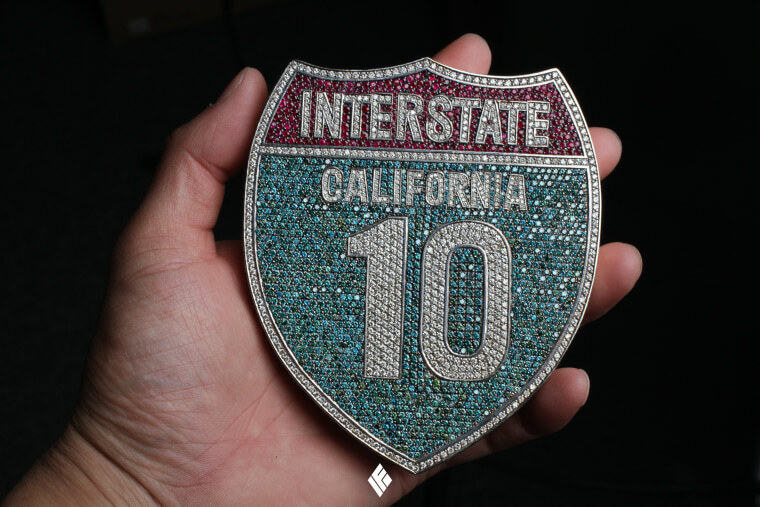 In 2004, Steve Her and Ben Yang founded IF & Co. -- which stands for "Internally Flawless," a grade of diamond clarity, as well as "Icee Fresh," a now-retired name -- to focus on custom jewelry.Courtesy of IF & Co.
Johnny Dang is an icon among hip-hop's A-list. Over his two decades as a jeweler, the 43-year-old Vietnamese-American immigrant has sold grills, watches, and pendants to Kanye West, Beyoncé, and Lil Wayne; had his name shouted out in verses by Migos and Wale; and made cameos in music videos by Nelly and DJ Khaled. Dang, known today as “TV Johnny,” was born just before the end of the Vietnam War in Đắk Lắk Province. His father fought for South Vietnam before fleeing to the U.S. in 1987. He told Johnny to learn to make jewelry while the family remained in Vietnam, before they reunited in Texas nine years later. It was the first time Dang had left the country. “After landing, I couldn't believe my eyes because I saw a two-level freeway,” he said. Dang got to work at a flea market repair stall, earning about $100 per month. By 1998, he had his own mall store (named TV Jewelry — T for Tuan, Johnny's Vietnamese name; V for Vietnam), before starting a partnership with local rapper Paul Wall in 2002. Grills — mouthpieces often made of gold and encrusted with diamonds — were soon to become a nationwide trend, and Wall's hip-hop connections made the store a go-to destination. A single grill for Lil Jon cost a reported $60,000, and the pair went on to sell to stars like Katy Perry, Lebron James, and Ryan Lochte. Custom jewelry for rappers is a lucrative niche. New York's Jacob Arabo, also known as Jacob the Jeweler, paved the way in the 1990s, and others have since entered the fray. In this industry, the more ostentatious the better, and clients' personalized, dreamt-up designs fuel ever-surging price tags. LA-based IF & Co.'s requests include a four-inch Pillsbury Doughboy pendant smothered in diamonds, a custom 14-karat gold Motorola Razr flip phone, and a diamond prosthetic eyeball. A four-inch Pillsbury Doughboy pendant smothered in diamonds from IF and Co. Co-founded by cousins Ben Yang (aka Ben Baller) and Steve Her (aka Slauson Steve), IF and Co. customers have included Michael Jackson, Mariah Carey, and Drake.Courtesy of IF and Co. While Dang is the flag bearer for the South, IF & Co. is the jeweler to the stars on the West Coast. Co-founded by cousins Ben Yang (aka Ben Baller) and Steve Her (aka Slauson Steve), their customers have included Michael Jackson, Mariah Carey, and Drake. Like Dang, Her and Yang are not only Asian American, but share humble origins, and leveraged a blend of inside connections and jewelry expertise. Her's father began a family jewelry business in 1997, after arriving from South Korea 15 years ago with $800 in his pocket. In the early 2000s, Her, who worked in the store, started making custom jewelry. Others are edging into the business, too. LA-based Christy Yi (aka Christy Cash) started her own outfit in 2015, and has made grills for producer Maejor. In Houston, Jimmy Phan (aka Jimmy Boi), the child of famous Vietnamese rockers CBC Band, took a circuitous route to jewelry preceded by dealing drugs under the name “Pill Gates,” three years in jail, and a rap career. Phan said he made $1.4 million in sales in 2015, his first year as a jeweler, while his rapping 10-year-old daughter Savannah is becoming Instagram-famous too. “What person doesn't like the finer things in life?” he said. Meanwhile, Dang, who started his flea market stall while living in a house of 15 people, opened a two-level, 14,000 square foot flagship store last year, and wholesales to countries like the U.K., Canada, and Italy. Two of his recent overseas clients were Suboi and Andree Right Hand — popular rappers from Vietnam. Correction: An earlier version of this story misstated Christy Yi's clients.